"Because there will always be clever men with misguided ingenuity who find it profitable to duplicate or invent historic letters and documents, the philographers of the future must be forever alert. I have not the slightest doubt that even as I write these words there is somewhere in America a nimble-fingered fellow touching a goose quill to parchment and concocting an exciting document that will fool at least one or two myopic historians and perhaps even a whole gaggle of scholars." "But he got the letter out; it was very early, 1827, and after two or three minutes, I said to him, 'I can absolutely warrant it as by Joseph Smith.' The letter was genuine beyond any question." "County Attorney Ted Cannon wrote commissioners, 'Hamilton is a forgery expert. He will review various documents and prepare expert testimony regarding (them).
" 'He is an important witness at trial. He consults with us on a regular basis during this case, and we with him. Expected total witness fee after trial testimony will be estimated at $10,000." "William Henry Ireland...was remarkably successful with his forgeries of Shakespearean documents....Ireland produced volumes from Shakespeare's library with annotations by the Bard of Avon, drawings by him, a love poem to Anne Hathaway, a correspondence between Shakespeare and his patron Southampton, and letters written to Shakespeare. The incredible acceptance of his literary creations encouraged Ireland to produce fragments of the manuscripts of Hamlet and King Lear, and finally to create a new drama attributed to Shakespeare, entitled Vortigern and Rowena. This work proved to be his undoing....The interest in his forgeries gave rise to nineteenth-century forgers who specialized in forging Ireland's forgeries.
" 'Antique Smith,' as Alexander H. Smith was known, was a highly skilled forger whose fabrications can cause problems for the collector of today. His career began in Edinburgh, Scotland, in the 1890's; and with great adroitness he forged letters and manuscripts attributed to Robert Burns, Sir Walter Scott, Mary Queen of Scots, Oliver Cromwell, Edmund Burke, William Pitt, William Makepeace Thackeray, James I of England, Charles I and II of England, and others. His calligraphy was excellent and was accomplished without tracing. His forgeries subsequently have acquired a genuine appearance of age, and they are frequently offered for sale in England and the United States. "Weisberg's great successes in the forgery business were with Stephen Collins Foster manuscripts, Washington and Lincoln letters an original surveys of Mount Vernon. His last forgery was an inscription by Katharine Mansfield in a copy of her book The Dove's Nest. The imitation of Mansfield's script was flawless, but Weisberg tripped up on a foolish anachronism. The buyer discovered that the book was published posthumously and complained to the cops. In Philadelphia Weisberg was tried and sentenced to two and a half years in Lewisburg Prison, where he died on May 4, 1945." "In the spring of 1976 an unemployed grocery clerk in Rumford, Maine, began peppering the nation with forged signatures of celebrities. These were so adroitly scrawled that half a dozen autograph dealers were delighted to buy them at bargain prices. Collectors all over the country spruced up their collections with brand-new signatures of John F. Kennedy, Marilyn Monroe, W.C. Fields, Adolf Hitler, Picasso, Errol Flynn, Walt Disney, Jacqueline Kennedy Onassis, Charlie Chaplin and even George A. Custer and Sitting Bull. Charles Hamilton felt that Clifford Irving was "the most audacious forger of this or any century." Hamilton related that Irving forged a 230,000-word "autobiography" of Howard Hughes while Hughes was still alive and sold it to "a top publisher (McGraw-Hill) for a vast sum of money ($750,000)." Irving also forged handwritten letters of Hughes to help promote the scheme. Hamilton commented concerning one of those letters: "The imitation is almost flawless, capturing not only Hughes's handwriting but his atrabilious disposition." (Ibid., p. 169) When Hughes Tool Company denied the authenticity of the Irving material, McGraw-Hill "consulted a handwriting expert who declared that the scribbling of Hughes in the letters and in the margins of the typed manuscript was authentic. "Life magazine had bought first magazine rights, and it now demanded that McGraw-Hill consult the world-famous handwriting experts Osborn, Osborn and Osborn...Paul Osborn and his brother Russell gave the handwriting a very careful scrutiny....Then they delivered their report. On page 257 of Great Forgers and Famous Fakes, Charles Hamilton points out that "For many forgers the ultimate goal is not to get rich by swindling easy marks but to see their fabrications touted as authentic by historians. Henry Cleveland created 'unknown' Lincoln letters just to fool historians and even took in Nicolay and Hay, Lincoln's secretaries and biographers." "Auction houses, document collectors and dealers in rarities from coast to coast are watching with keen interest the mounting evidence presented in the preliminary hearing for bombing suspect Mark W. Hofmann. "But the national interest is not focused on the tragedy of the murders...It's centered on the prosecution's assertions that Hofmann is an expert forger of historical documentsa perpetrator of crimes that could rock the entire business of documents dealing for years to come.
" 'On a national scope, it makes a lot of people who deal in documents and rare books extremely uneasy,' said David Hewett, contributing editor for the Maine Antique Digest, one of the nation's foremost publications on art, rare coins and American antiquities. "Hewett, who is in Salt Lake City covering the Hofmann hearing, said if Hofmann is convicted of the theft and fraud charges, it would not make him the most prolific forger in American history, but he could go down in history as one of the most successful and far-ranging of the 20th century. "What will be particularly disconcerting to national dealers, Hewett said, is the apparent ease with which printing plates can [b]e made of rare documents and currency. "Paper of the right age has always been available, but I have [ne]ver heard of a case where we've had someone order printing [pl]ates to forge something on old paper. This kind of forgery, if [in]deed it proves to be a forgery, opens a whole new spectra of [f]raud. It's going to make a lot of people extremely uneasy.' "
" 'Where does be get them? All of the sudden there's this one guy who keeps coming up with these things, worth all that money. These kind of documents, don't just lie around for years and years.' Sheriff Hayward said. "Also Thursday,...Police returned to his house with another search warrant after retrieving some evidence Wednesday night. Among that material, which included blank parchment-like paper, personal documents and clothing, were items which Sheriff Hayward said 'that there is speculation that these things could be used in forging documents.' 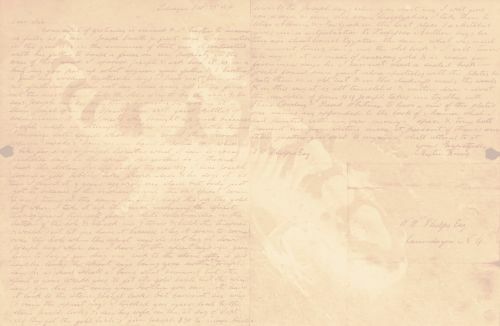 "
"Speculation that the controversial 1830 Mormon 'white salamander' letter...is a forgery has prompted the church to send that letter to the Federal Bureau of Investigation's laboratory for authentication. Some of the voluminous documents found in both Mr. Hofmann's home and his burned-out car...also will be taken to the FBI lab for tests." "One investigator working on the murder case believes evidence may point to a long-term, premeditated fraud plan on Hofmann's part. Evidence is not self-interpreting but the fact that police found in Hofmann's possession photo enlargements of historic manuscripts with recent notes in the margins about grammar and syntax, plus supposed 'practice sheets' of old signatures, paper-making and electrolyting equipment, and a book on 'famous forgeries' suggests to this investigator the makings of a forgery operation. "According to this theory, Hofmann may have taken advantage of his knowledge that, despite its gigantic collections of rare and valuable documents, the LDS church has no employees qualified to perform forensic authentication. Add to this the fact that church leaders had previously demonstrated a concern that sensitive documents may fall into hostile hands, and we may have a perfect setup for a seller of forged documents of presumed spectacular content. Naive, overly-motivated and highly secretive buyers are vulnerable targets for expert exploiters, theorizes one investigator close to the case." "LDS historical department employees say federal and county investigators have sifted documents all week in a room recently provided with a special lock. A forensic specialist from the Utah attorney general's office and another from Arizona are assisting in the examination, with the help of infrared and other special equipment. "Allen Roberts, a local architect and historian, said [Richard P.] Howard told him Tuesday that all documents relating to Hofmann were being examined." " 'The ink looked good. It looked old. The documents were quite well done. But they were obvious fakes,' said Kenneth Rendell. "Rendell, of Newton, Mass., says investigators from the Salt Lake County attorney's office flew to Boston last Friday and brought with them about a dozen of the documents that were alleged to be fraudulent in charges filed this week. "Rendell said he examined the handwriting on each document and found that nearly all of them featured the blotchy, shaky and uneven appearance that indicates the letters were copied rather than drawn freely. He also said similarities in the style among the documents suggests that some of them were done by the same person. "What's more, virtually all of the documents glowed a bright blue when placed under ultraviolet lighta sign that a chemical may have been used to artificially age the paper." QDo you have membership or position in any particular professional associations or boards? AI'm on the board of directors of the American Board of Forensic Document Examiners. QCan you tell us what that is? AYes. There are...in the United States and Canada...currently 232 board certified examiners. The American Board of Forensic Document Examiners is an arm of the American Academy of Forensic Scientists, which board certifies forensic doctors, forensic pathologists,...around 1977-78, we began to board certify forensic document examiners. QDo you have any particular duties in relationship to that certification? AYes. I'm one of the ten document examiners in the United States that now administers the...one year testing process to all of the other document examiners in the United States that wish to become board certified. QHave you been board certified? AI was in the first 25 board certified document examiners in the United States. QWith respect to the ink, did you find any peculiar or abnormal characteristics associated with any of the documents? QCan you tell us...what that would be? AYes. On many of the documents,...there appeared a microscopic cracking on the surface of the ink. These appeared on the questioned...documents that we were examining. QBesides the cracking, was there any other characteristics? AYes. Under ultraviolet examination, on several of the questioned documents, there was a one-directional running of the inks or a constituent part of the inks, as if they had been wet. QWere you able to determine if there had been any additions on any of the documentsany additional applications of ink? AYes. On several of the documents, there were inks that were not consistent with the body of the document. That is to say that data had been added to the document with a different ink. QNow,...besides these characteristics, was there anything common about the documents that you found these characteristics on? AThese anomalies that I spoke of all occurred on documents that had been dealt by the defendant in the case, Mark Hofmann. QCan you tell us which documents these were? AYes. The documents, in particular, that we found problems with were...the Anthon transcript, the Joseph Smith III Blessing, four different white notes, the Lucy Mack Smith document...the Josiah Stowell letter of June 18th, 1825, the document we call the E.B. Grandin contract, the Martin Harris-W.W. Phelps document called the Salamander letter,...the General Smith, General Dunham (I'm sorry) -Joseph Smith letter, the David Whitmer to Walter Conrad document, the document later called the Betsy Ross letter, the Solomon Spalding-Sidney Rigdon land deed, the letter to Brigham Young from Thomas Bullock, dated June 27, 1865, a promissory note to Isaac Galland from Joseph Smith, a letter called the Maria and Sarah Lawrence letter, the Samuel Smith Bible, the Nathan Harris prayer book, the Bithel Todd-Peter and David Whitmer document, and then later there were several types of currency that were also examined. QDid you mention Jim Bridger in that? I'm not sure. QLet me ask you this. Besides these particular ones that you've mentioned, associated with Mr. Mark Hofmann, were there any other documents out of the 461 or so that you have examined that exhibit these characteristics? QWere there any other documents, to your knowledge, that came through Mark Hofmann other than the ones you mentioned here that did not exhibit those characteristics? AYes,...actually there were many documents that had been associated with Mark Hofmann that did not exhibit those particular phenomena. QAnd were there any documents that were not associated with Mark Hofmann that exhibit those characteristics? QDid the fact that these characteristics appeared only on the documents associated with Mark Hofmann have any significance to you? AWell, insomuch as it formed...a pattern that was significant to me, yes. QAnd associated with that pattern, did you conduct any research or experimentation? And if so, what was your purpose? A...I had not seen that cracking phenomenon that appeared...in the ink morphology of these questioned documents on any of the other documents that were examined. And I did not initially know what caused that, so part of my research was to determine what the ink cracking was and...why it was caused. QLet me ask you this, if I may,...did you do some research as far as looking up literature and trying to determine whether or not that particular characteristics or patterns had been observed before? QTell us what you did and what the results of your research were. AWell, like all good researchers, I tried to see if someone else had done the research first so I wouldn't have to do it. In that respect, I researched all of the texts concerning questioned documents of that time period that I could lay my hands on. QDid you have any particular special library or materials associated______? AYes. The Questioned Document Laboratory at the Department of Public Safety where I work has probably the most extensive historical library on questioned documents west of the Mississippi. We have documents, we have texts in that library that date back to 1620, for instance. I researched all of those texts. I then went to the Arizona State University Science Center and researched the materials that were there on early ink manufacture,...I tapped the resources of many of the other document laboratories around the United States, including the library of probably the top ink forensic chemist in the United States. As well as the Food and Drug Administration, which was also kind enough to supply me with texts involving gums and sugars. QAnd from that, were you able to determine whether or not this particular phenomenon that you had observed, had it been observed naturally, in a natural setting, by any of the other people in any of the literature? AI found no other reference to that cracking phenomenon in any of the other literature, albeit literature that would have dealt with genuine documents or documents that had been fraudulently made. I didn't find any other reference to that ink cracking. QHow about in communication with other experts? ANone of the other...forensic experts that I talked to around the United States had ever observed that cracking phenomenon. QDuring this examination...were you able to examine other 19th century documents besides the ones that you saw in Salt Lake City? QAnd approximately how many of these and where did they come from, if you know? AYes. There were 25, I think they are called blank covers, that were acquired here in Salt Lake City and sent to...my laboratory in Phoenix, Arizona for some testing. QWere these...coverless stamp letters or stampless cover lettersexcuse me? QAnd when were these documents reportedly written? AThese documents covered the time span from about 1830 through about 1850. QAnd did any of these documents exhibit that cracking or the other phenomenon you thought? QWere you able to...determine the characteristics or the formula or the type of ink that was used on these particular documents that you mentioned? QCan you tell us what you did and what you found out as far as the kind of ink? AThe inks on the questioned documents are...iron gallotannic inks. These are inks that would have been typically used in that time frame, from 1800 through 1940's, really. They form the basis of what fountain pen [ink] still is to this day, iron tanic or iron gallotannic inks. These are very simple inks. I made some of these inks in my kitchen sink, to give you some idea. There's not a lot of technology that's involved in forming the iron gallotannic inks. QWere you able to determine the make-up of the ink or were you able to determine the formulas? QWere you able to go any particular place or read any place where these different formulas for iron gallotannic ink [are located]? AWell, Charles Hamilton had a formula for iron gallotannic ink in his text. QDo you know what text that is? QIs it [iron gallotannic ink] comprised of items that would be readily accessible? QLet me ask you this. In your research or in your experimentation, were you able to come to a conclusion or able to determine, from the gallotannic ink as a basis, how it was that the cracking effect would occur? QTell us what you did, what your experimentation was, what you came to conclude. QIt was something that was common to the iron gallotannic ink at that time? AYes....gum arabic had been used... [for] thousands of years really. Gum acacia is another name for it. It comes from the acacia tree. But it was commonly added to the ink to give it body, as a viscosity adjuster to adjust the thickness of the ink, and also as a preservative. It slowed down the oxidation of the ink on the paper. When I mixed the iron gallotannic inks and added either the sugars or the gum arabic and then artificially aged them with the sodium hydroxide, I got exactly the same...phenomenon that I described in the examination of the questioned documents. The ink both artificially aged and cracked. QIs that something that is readily available? AYah. Ammonium hydroxide, delute ammonium hydroxide is household ammonia. QDid you experiment with household ammonia? QAnd what was the results of your______? AIt worked. It would artificially age the iron gallotannic ink. QThen you mentioned another chemical too? QIs that something that's very common and readily available? QDid it perform the same results? AYes. Actually, the sodium hydroxide is a stronger base, actually works better...but both will produce the same results. QWere you able to determine...the explanation for how it is that ammonia or the other chemicals affect the iron gallotannic ink to produce results that you're seeing? QHow about the cracking effect? AThe cracking effect...on the surface of the ink takes place, I believe, because of the viscosity change that the gums and sugars undergo when they go from an acidic state to an alkaline state. The iron gallotannic inks are typically very acidic. It's not unusual to have iron gallotannic inks that have a pH as low as 3.5, for instance, or 4....in the past that was actually [a] desirable quality because it allowed the ink to penetrate into the paper fibers....That worked very well until steel pens were developed and then the acid would actually corrode the steel tips, so in later years, they began to neutralize the ink more and more, but as long as the gum is in that acidic ink, it's fairly fluid. When the pH is raised by the exposure to ammonia or sodium hydroxide, the gums undergo a drastic viscosity change. They...become much thicker and brittle. And its amazing under a microscope, you can put a drop of sodium hydroxide on iron gallotannic ink with gums or sugars and watch the ink crack. It will, as soon as the liquid portion evaporates. What remains will be a dark brown rusted ink with cracked surface morphology. QWhen you say the application, in what way can...these chemicals, the ammonia, be applied? AThey can be fumed. They're quite volatile. You can simply tape a document inside a tank and the fumes will attack the ink. You can spray them with a air gun. You can dip them. Although William Flyn seems to have been the expert who solved the mystery of the cracked ink, George Throckmorton did a great deal of work on the documents. 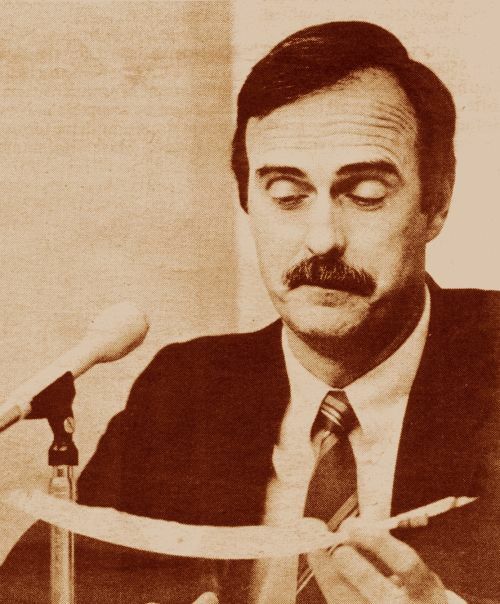 Paul Larson called Mr. Throckmorton "the only forensic document examiner now practicing in the State of Utah" (Utah Holiday, December 1985, page 84). In his testimony, Mr. Throckmorton said that "In this investigation, I examined 688 documents that were written in iron gallotannic ink." 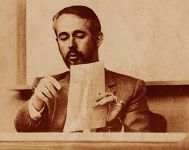 George Throckmorton, like William Flyn, testified that when many of Hofmann's documents were examined under a microscope, they had cracked ink. Mr. Throckmorton described the cracked ink as looking like the "skin of an alligator." He claimed that "There were a total, if I recall from my memory, of the 688 I observed, 21 that had this characteristic cracking effect." When Throckmorton was asked where the 21 documents that had cracked ink came from, he replied that it was his understanding that they all came "through Mark Hofmann." When he was asked if the ink on any of the remaining 667 documents showed evidence of cracking, he responded: "No, there was none." 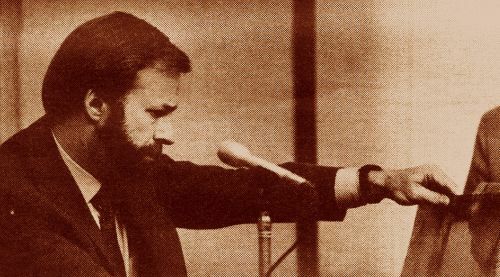 Albert H. Lyter, the ink specialist who had previously examined the Salamander letter for Steven Christensen, was called upon to help in the research on the Hofmann documents. Throckmorton said that Mr. Lyter "spent a couple of days" working with the investigators in Salt Lake City. QWere you able to reproduce the cracking in the ink or the running that you observed under ultraviolet light through the treatment of ink and paper through deacidification...? Q...through the deacidification process solely? QYou were also asked by Mr. Rich if you were aware as to, shall we say, deacidification of papers, which would be a normal course of routine for the preservation of documents. Is that correct? QAnd you had seen under ultraviolet light at other times deacidified documents, had you not? QAnd you had seen this [a] number of times? QLet me ask you this. In your experimentation, did you take into effect whether or not any normal preservatory effort by archivists would have any effect on this cracking phenomena. For example, whether or not a document had been deacidified or had been washed or bleached? QTell me what you did and what your results were. AYes. I had access to, on my, I guess it was on the second trip the State Crime Lab, we had obtained some typical fixing compounds. One of the techniques that archivists use is...to deacidify the document. Again, that's done primarily because of the highly acidic nature of the inks. Many of the old inks would literally eat right through the paper over a given period of time. Those typical archival preservatives were used on the ink that I made and on some of the older documents that were not in question. And in no instance did we find those archival treatments to affect the ink and crack the surface. QSo, the application of any of these preservative methods was not a, could not contribute to the cracking of the ink. Is that correct? AAs far as we could tell, that's correct. AWell, first of all, the documents other than the Harris letter...all had strong indications of being forged...just on a strictly handwriting basis. They had a drawn appearance. They had slow, hesitating strokes. There was rewriting and so on. All the standard types of things that I would look for. When I was in my office, I put them under very strong ultraviolet light and they fluoresced a very bright blue, and you could see...that a chemical of some type had been put on the paper. I had never seen anything like it before. There were marks where it had either been put with clips so the documents had been dipped or they had been painted. In one case, there was a document made out to Joseph Smith, which was perfectly genuine, there were three lines on the back which were very questionable and only those three lines were covered with the chemical. There was no question in my mind that there was very probable reason to believe that...these documents were not genuine. Mr. Rendell claimed that when the documents were first shown to him in Massachusetts, he "was told nothing" about where they came from. He said that after examining them under ultraviolet light, he told investigators that "the key thing I thought where they had to go was into chemical analysis, and they had to find out why these are blue under fluorescent light. I had never come across documents fluorescing blue like this. It clearly was something that was added on. You had all kinds of paper but they all flouresced exactly the same. They shouldn't, and I said you've got to go to chemists." George Throckmorton also noted that "many of the documents" had a "characteristic blue hazing effect under ultraviolet examination." Mr. Throckmorton experimented and found that ammonium hydroxide, which was used by William Flyn to artificially age the iron gallotannic ink, gave the documents a blue hazing effect under ultraviolet light: "The blue hazing effect which was observed could have been produced in two different manners...I noticed in my personal tests that on some of the paperssome of the old papers that we had for experimentation purposessome of those papers after being dipped or treated with ammonium hydroxide did leave sort of a blue hazing effect under ultraviolet light. Others also when they were treated with a sodium hypocloride solutiona very weak solutionit left a blue hazing effect on the documents. So the hazing effect could have been duplicated by either one of those procedures. I'm not sure which." AAs I'll use it in my testimony, it [bleeding] refers to a portion of the ink that would normally be invisible but is made visible under ultraviolet light. On several of the documents,...some constituent part of the ink...ran from the characters. In most instances, it ran in a unidirectional way. That is to say, it appeared that the document had been held vertically and wet so that the running was down, in one direction. It was not even haloing, where the running extended outward evenly in all directions, but rather it was more like a one-directional running. Q...Did you find any indications of this same sign of running under ultraviolet light on any of the documents other than the Hofmann documents? QOut of all the hundreds you examined it was only on the Hofmann documents? AYes. Of the 461, I did not see it on those documents. George Throckmorton testified that some of the Hofmann documents seemed to have been cut with scissors or a razor blade. According to Mr. Throckmorton, this problem was detected in the following way: "By placing the paper on a flat surface, and by putting a straight edge of some type on top of that and examining it under a microscope, you can see how close the edge of the paper would correspond with the straight edge. It would also be possible to detect, many times, individual scissor marks or razor blade cuts or things similar to this." Mr. Throckmorton indicated that the Spalding-Rigdon document had "very obviously been cut in several places." He claimed that "a small portion" had been cut out of the "bottom right hand side. Also the uneven nature of the bottom portion indicates that it also had been cut. The top portion had been cut on this one." Throckmorton said that the Betsy Ross letter "had been cut on both the upper and bottom portion of the letter itself." He also noted that "The letter had been cut after it had been folded." With regard to the letter by David and Peter Whitmer to Bithel Todd, he said that "The upper portion of the letter has been cut off. Again, it appears to have been cut after it was folded." Mr. Throckmorton also testified that Joseph Smith's 1825 letter to Josiah Stowell had been cut: "...this is one of the letters that also had been cut....I do remember that it was cut but I can't remember whether it was the left or the right hand portion that had been cut off." With regard to the Salamander letter, Throckmorton commented: "This document had been cut." He went on to state: "There are two cut marks in this particular document. There's a small square cut in the upper right hand corner of the document. Also,...on the address side,...there is a sealing wax that remains on the letter. This side closest to the sealing wax has been cut off. A portion of the paper has been removed. Although it is certainly possible that cutting could have occurred on letters written in the 19th century, the fact that so many of the Hofmann documents were cut points toward falsification. Throckmorton claimed that he examined other 19th century cover letters and did not find evidence of cutting: "From those that I examined, I was unable to find any of the covers that had been cut, where a section had been cut off." One would infer from Mr. Throckmorton's testimony that he believed that some of the Hofmann documents were actually cut off larger pieces of paper that had been used in the 19th century. Cutting could also indicate that material which was originally on the paper was being suppressed. Although the experts all seemed to believe that the ink had been artificially aged in the Hofmann documents, they felt that in most cases the paper was actually genuine paper of the period. William Flyn said that "The initial examination disclosed that the papers...appear to be genuine period papersthat is to say...the morphology of the paper conformed to the papers that would have been available...throughout the 19th century." Kenneth Rendell indicated that it was fairly easy to get paper dating back to the 19th century. Speaking of the Salamander letter, Rendell commented: "Everything appeared to be perfectly normal of that period, and that was what the paper report was, which I fully expected because to get paper is not difficult at all for that type of thing." Before the bombings, one of Mark Hofmann's associates did his best to try to convince Sandra and I that it would be impossible to apply ink to ancient paper without the ink feathering in such a way that the forgery would be detected. Charles Hamilton speaks of this problem in his book Great Forgers and Famous Fakes, page 206: "The feathering of ink is one of the most obvious marks of a modern fake on old chain-lined paper." Mr. Hamilton informs us, however, that it is possible to size the old paper so that the modern ink would not feather." On page 10, Hamilton says that Charles Weisburg "failed to 'size,' or chemically gloss" a Lincoln forgery, and therefore "his ink has feathered or fuzzed, when it went on the old paper." Speaking of Joseph Cosey, Mr. Hamilton gave this information: "Cosey cannot be faulted on his paper. It is the typical, chain-lined, hand-laid pure rag paper of the Revolutionary era. No doubt Cosey stumbled upon a supply of it, or else removed blank portions of paper from insignificant or valueless documents. QAre you a member of either the LDS Church or the Reorganized LDS Church? That the documents are not authentic seems to rest upon very solid scientific evidence. While some people have been willing to admit that part of the printed material Hofmann sold was forged, they have not been willing to concede that the handwritten documents are spurious. This argument, however, seems to be destroyed by Mark Hofmann's connection with the Jim Bridger notes. These notes combine printed material with handwriting and signatures ' and there is no way that the handwriting and signatures could have been added to the documents before they were printed. We first became acquainted with the Jim Bridger notes when we received the April 1985 issue of a catalogue published by Cosmic Aeroplane Books. This catalogue contained a photograph of a Jim Bridger note and a statement that this is an "Excessively rare partly printed document signed with his [Bridger's] 'X,' March 8, 1852...Auction records and catalogues going back 70 years have been consulted and no other example of Bridger's X was located therein. In other words, this is an incredibly rare and highly desirable autograph." The price asked for this document was "[$]9,995.00." A photograph from the catalogue of Cosmic Aeroplane Books for April, 1985. Notice that a Jim Bridger note is being offered for $9,995. After the bombings investigators discovered that this note was obtained from Mark Hofmann and that it is a forgery. "On March 3, detectives went to Utah Engravings and looked through boxes of engraving plates. In one box, investigators discovered a negative of a promissory note that Bell called the 'Jim Bridger note.' 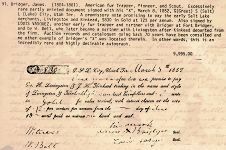 Hofmann is charged with theft by deception in connection with the sale of a promissory note purportedly carrying the "X" signature of American frontiersman Jim Bridger." QWhat did you tell them about those items? AAh, I probably told them that they were mine. QNow, was that something that was worked out beforehand between you and Mr. Hofmann? "Mr. Flynn, who said he made a meticulous accounting of the transactions he and Mr. Hofmann were involved in, said two of the notes were sold to noted handwriting analyst Charles Hamilton for $5,000 each; two to Provo attorney and antiquities collector Brent Ashworth for $5,000 each; one to Deseret Book for $4,500; one traded to Cosmic Aeroplane Books; one sold at auction at Sowthby's Auction House in New York City for $8,602.50; and later eight more to Mr, Ashworth for $24,000 cash and trades. "Brent Ashworth is listed as buying a total of ten for $34,000. He actually only bought two. Sotheby's is listed as selling one and delivering an auction net of $8602.50. Mary-Jo Kline at Sotheby's has been their Americana paper expert for the last three and a half years. She says in all that time they have never listed, sold, had withdrawn, or failed to sell one single Jim Bridger note. Steven Barnett, of Cosmic Aeroplane, did testify "that he purchased two Jim Bridger promissory notes from Hofmann, one for the store for about $5,000 and one for himself for which he traded autographs worth about $5,000. In his testimony, Brent Ashworth claimed that the price "was $5,000," on a Bridger note he bought from Mr. Hofmann. He later obtained a second note for "the same amount." Between the two transactions, Hofmann called him and said there "were four Jim Bridger notes." Mr. Ashworth says he was "a little upset about that because we'd spent some time talking about this single Jim Bridger note, and all of a sudden there were four." Ashworth claimed that Hofmann had informed him "that he'd gotten these all out of a book from Livingston and Kinkead, which was the outfit that they're all made out from." Document examiner George Throckmorton said that he examined the negative Hofmann obtained and found it to be the source of the printed notes: "This negative was used to make a plate. The plate was later used to print this note." In addition to the hard evidence furnished by the negative, the handwritten portions of the notes were examined and it was found that some of them had the cracking of the ink found in the other forgeries. William Flyn testified: "The...Bridger notes...contains handwritten text which is in the cracked ink that I've mentioned earlier." When asked about the authenticity of one of the notes, Mr. Flyn responded: "It's a non-genuine document in my opinion." When George Throckmorton was asked if he observed any cracking in the ink, he stated: "Yes. I was able to observe a characteristic cracking of the ink on three of the Jim Bridger notes..." Mr. Throckmorton reported concerning one of the notes he examined under ultraviolet light: "...this note showed under ultraviolet light a running effect of the ink as if it had been clipped or tipped or tied from the upper right hand corner,...and then treated with some type of a chemical. As the chemical reacted with the ink, it caused the ink to run in a downward portion. And that was visible, that running effect was visible under the ultraviolet examination." When Throckmorton was asked about the purported Jim Bridger "X" on the notes, he replied that he "could not" determine if it was actually Bridger's "X." He did have an opinion concerning two other signatures which appeared on the notes: "...the [Vasques] signatures themselves are inconsistent with each other. From that there's a high probability...he did not sign all four of these...there is too much variation between the signatures to have been written by the same person....In fact, it is more consistent if someone were trying to disguise or change their own handwriting and write the name of Louee Vasques. It's more consistent with that." Throckmorton also noted that the "W. Bell" signatures on the notes were "not the same; they're not consistent, as if...there was a person by the name of W. Bell signing his name....It's more consistent with somebody else trying to write the name W. Bell on two different occasions." From the evidence presented here, the reader can see that it is impossible to separate the printed forgeries from the handwritten documents. The Jim Bridger notes, which Hofmann began selling in 1984, had to come from the engraved plate which he ordered. The negative establishes this beyond all doubt. It is evident, therefore, that the handwritten material, including the two signatures, was added after the notes were printed. This, of course, means that someone had to forge these signatures. There is just no way to get around these conclusions. Furthermore, if Mark Hofmann is not the forger, he would have to know his or her identity. While George Throckmorton's testimony on the Bridger notes seems to cast doubt on the skill of the forger who added the handwritten material, other testimony which he and William Flyn gave indicates that there was a master forger involved in the handwriting which appears on some of the documents. In many cases they could not say the documents were forgeries on the basis of the handwriting or signatures alone. Kenneth Rendell was more critical of the handwritten documents, but even be admitted be could see no obvious evidence of forgery in the handwriting appearing in the Salamander letter and the Lucy Mack Smith letterRendell, of course, had only signatures of Martin Harris to compare the Salamander letter with and did not have an example of Lucy Mack Smith's handwriting. One thing that is extremely interesting to note is that the major handwritten forgeries seem to have almost ceased with the appearance of the Salamander letter in late 1983. From that time, Hofmann seems to have produced mostly printed forgeries. In fact, instead of forging Jack London's name and a short inscription in a first edition of Call of the Wild, Hofmann ordered a metal plate to do the job! If Mark Hofmann was the master forger who created the earlier documents, it seems very strange that he would have to resort to such an inferior process to reproduce Jack London's writings. This leads me to question the idea that Mark Hofmann was the master forger who did the handwriting on the earlier documents. It appears to me, in fact, that this individual almost ceased to function in the last two years of Mr. Hofmann's career. While one could theorize that Hofmann himself was the master forger and that he may have become fearful of being detected if he continued to produce sensational documents, all the evidence points to the fact that he was becoming even bolder in his final days. Take, for instance, the Spalding-Rigdon document he showed to Hugh Pinnock. This would be a highly controversial item which should have been created in a way to prevent detection. Instead, however, it was done in a very crude way. An old document was obtained, the date was altered and the two signatures were added in a different ink than the original. The whole thing is so clumsy it almost cries out for detection. The method in which the purported Betsy Ross letter was produced was even more bizarre. Instead of the letter being written out in a consistent style (as in the case of the Salamander letter), an old letter written by someone else with the first name Betsy was obtained. The last name was removed from the letter and the word Ross was inserted in its place. The date also had to be altered so that it would fit into the period in which Betsy Ross actually lived. If Mr. Hofmann had the ability to create such documents as the Salamander letter, the Lucy Mack Smith letter and the Grandin contract, why would he use such outlandish methods to produce these documents? It seems strange, also, that a man with such ability could not create the McLellin papers he had talked so much about. It would almost be possible to believe that the "master forger" died in late 1983 if it were not for the fact that an inscription purporting to be in the handwriting of Martin Harris was added into the Nathan Harris Book of Common Prayer just about a month before the bombings. The document examiners seem confident that this inscription was written in the very hand found in the Salamander letter. Because of this inscription, I am left with just two theories. The first is that the "master forger" was for some reason unavailable or unable to continue the work for about two years. If he had moved and Hofmann had no way to contact him for some time, this might explain the situation. Another explanation might be that he went to prison in late 1983 or early 1984. It would be very difficult to work on forgeries of this nature while in prison. It would also be extremely dangerous for a person to attempt to sneak in the old paper and special ink needed to make them. It is conceivable, however, that one page from the Nathan Harris Book of Common Prayer could be smuggled in and the short 21-word inscription made without detection. My second theory is that the "master forger" became unwilling to go on with the work. One reason for this might be that he feared exposure. In early 1984 we not only suggested the possibility that forgery was being committed, but we also spoke of the source from which portions of the Salamander letter was apparently derived. By August 1984, 1 wrote that I was also investigating other Mormon documents discovered since 1980. Although few people took the matter seriously, the forger could have become concerned that some hard evidence would eventually turn up. The fact that a major newspaper like the Los Angeles Times would tell of my suggestion of forgery might have been very disconcerting to someone who was not as bold as Hofmann. Under these circumstances, such an individual might inform Hofmann that it would be too dangerous to continue to flood the Mormon market with sensational documents. The creation of a controversial collection like the one Hofmann proposed for McLellin would be out of the question. On the other hand, Hofmann might have been able to convince such an individual to write the Martin Harris inscription in Nathan Harris' Book of Common Prayer. This is a poem which was apparently known in the 19th century. Its contents would not be controversial in any way, and it could not be checked stylistically. Furthermore, Hofmann could argue that it would increase support for the authenticity of the Salamander letter. As I have already stated, it could be argued that Hofmann himself was the "master forger" and that he was totally responsible for all the forgeries. He certainly seems to have had the same formula for the ink during the period when he produced the Jim Bridger notes as he had earlierthe ink cracked in the same way as on the Salamander letter and the 1825 letter. It appears, also, that the documents were aged in the same way. One could probably argue that Hofmann just became lazy and no longer desired to exercise his calligraphic skills. At the present time, however, I find this explanation a little difficult to accept. It seems to me that the time and money he spent getting the Jack London inscription onto a metal plate and the work of actually printing it in the book would far exceed that required to just write the inscription with a pen. I must admit, of course, that anything is possible in this bizarre case, and I do not pretend to have all the answers. Perhaps the truth about this matter will come out when the case goes to trial.